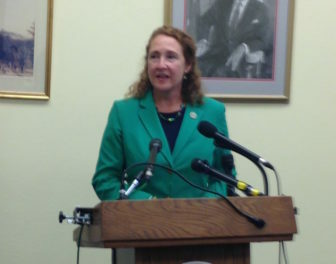 Washington – Rep. Elizabeth Esty, who had to reach into her own pockets to help fund her first bid to represent the 5th District, will leave Congress with a hefty war chest. Esty, a Democrat, has raised nearly $1.5 million for re-election and reported nearly $1.6 million in cash on hand as of March 30. Esty, who in her first bid for Congress loaned her campaign $300,000, has in this cycle raised more campaign cash than any other Connecticut member of the U.S. House. But she is leaving office at the end of the year, deciding to quit Congress after members of her own party blasted her handling of a former chief-of-staff accused of abuse. According to Federal Election Commission regulations, Esty must return much of that money to donors within 60 days of her April 2nd announcement that she would not seek re-election. Esty can keep donations earmarked for a primary election, but must return all contributions intended to fund her campaign for November’s general elections. According to the FEC, the rest of her campaign funds must be donated to non-profit organizations. That includes other state and federal campaign committees, subject to state and federal limits on the amount of those donations. She also can give an unlimited amount of money to state and local party organizations and to charities. A spokesman for Esty said no decision had been made and that the congresswoman was focusing first on returning all the donations that are required under the FEC’s 60-day deadline. The declared Republican candidate for the 5th District race, former Meriden Mayor Manny Santos, reported raising $16,305. The only Democrat in the race so far, former Simsbury first selectman Mary Glassman, has just filed her statement of candidacy with the FEC and won’t have to file a fundraising report until July 15. Rep. Jim Himes, D-4th District, raised more than $1.1 million for re-election and reported nearly $2.5 million in cash on hand as of March 31. His GOP challenger, Harry Arora, an investment manager from Greenwich, reported raising more than $692,000. Most of that money, $500,000, came from a personal loan to his campaign. But Arora has not been running long, entering the race in late December. The other Connecticut House members also are outpacing their rivals when it comes to raising political cash. Rep. Rosa DeLauro, D-3rd District, raised more than $760,000 in this campaign cycled. A Democratic challenger, Bryan Neal Anderson, reported raising about $15,000 by year’s end. A Republican challenger, Angel Cadena, has not reported raising any money. “We are proud that the average online contribution is just $25.47, which demonstrates the strong support Rosa has from working families in Connecticut,” Tickey said. Rep. Joe Courtney, D-2nd District, raised more than $667,000 for his re-election and had nearly $970,000 in his campaign war chest at the end of the first quarter. His GOP opponents, Alton Clayton Slawson and Danny Postemski, did not report raising any money. Postemski just entered the race. Rep. John Larson, D-1st District, raised about $828,000 for his re-election. He does not have a declared challenger. In Connecticut’s race for U.S. Senate, Democratic Sen. Chris Murphy, has raised about $12 million to defend his seat. The latest reports for Republican candidates Dominic Rapini and Matthew Corey were not publicly available yet. Corey reported raising about $8,000 as of the end of the year. Rapini said he raised about $35,000 in the last quarter, and a total of about $150,000 so far. He said he expected his fundraising pace to pick up after the state GOP nominating convention on May 11-12, which will determine whether he or Corey faces Murphy in the general election. “We knew that until the convention, our numbers would not be big,” Rapini said.